Old Quincy (originally Mather Hall) was erected as an addition to Leverett House. The U-shaped, Georgian Revival structure, built in 1930, was transferred to Quincy House when its larger, modern companion building was constructed in 1958. Renovation of the 12 undergraduate Houses--likely the College’s highest physical priority, and its most costly and logistically complex--will advance under a plan, announced in mid January by Faculty of Arts and Sciences (FAS) dean Michael D. Smith, to empty and redo “Old Quincy,” one part of the Quincy House complex, at the corner of Plympton and Mill streets. 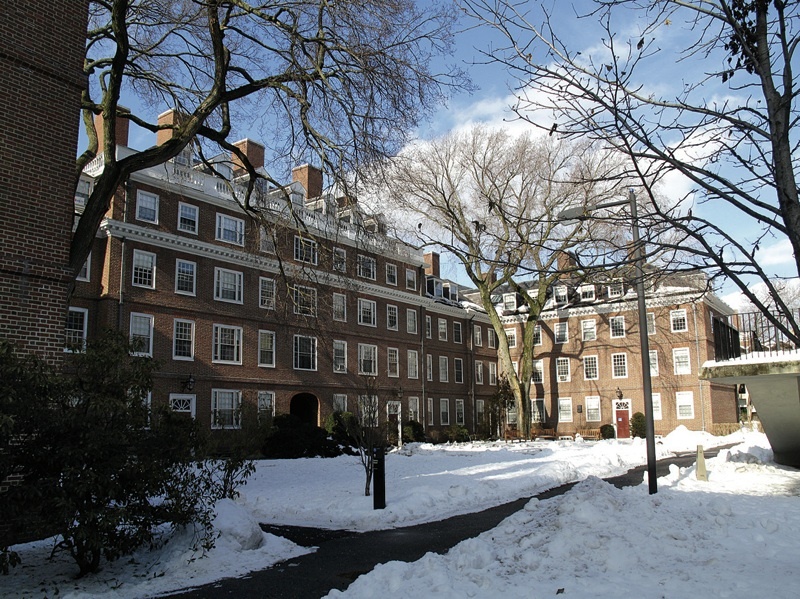 During the test project, which is expected to require 15 months--a full academic year and the summers before and after, beginning in June 2012--180 students will reside in swing spaces from the Harvard Real Estate inventory of nearby properties. According to the announcement, “Old Quincy House, about half the size of most of the neo-Georgian Houses and without its own dining hall or master’s residence, provides a valuable opportunity to test design concepts, while limiting disruption of the House community.” Preliminary plans have been drafted by the architectural firm KieranTimberlake (whose many higher-education assignments include the recent renovations of six undergraduate residences at Yale); they will now be reviewed with House constituencies and made final. Then, according to the announcement, Smith expects to present a funding plan for the work to the Corporation this fall, and to proceed to construction in mid 2012. In a briefing for the faculty last October, Smith identified House renewal as his principal building objective for a University capital campaign (see “Time to ‘Change the Channel,’” November-December 2010, page 63). He called the Houses the “cornerstone” of the undergraduate experience, and stressed that they needed to be reconstructed to make them fit for twenty-first century education and life. In preparation for this project, we have identified a funding plan composed of a mix of University investment and donor support. The upcoming University campaign will be critical to our ability to enlist the donor support we would need to launch the larger project of renewing all the Houses. As was true when the Houses were built, this project will require philanthropy on a transformational scale. The full construction program--expected to cost more than $1 billion during an extended period in which undergraduates would have to be successively relocated--has been postponed in the wake of the financial and market reverses in 2008 that reduced the value of the endowment and caused budget cuts to be instituted throughout FAS and the University. Because FAS took on considerable debt to build large science laboratories during the middle of the last decade, reducing its financial flexibility today, Smith has sworn off further substantial borrowing for capital projects; hence the need to raise funds for this long-anticipated undertaking.